The Portuguese logistics and distribution transport companies HAVI, Santos e Vale and Transportes Paulo Costa & Ferreira have acquired IVECO and Scania Group LNG trucks within the framework of the ECO-GATE action, which is co-financed by the European Union’s Connecting Europe Facility (CEF programme). These companies will contribute to the ECO-GATE (European COrridors for natural GAs Transport Efficiency) action by making use of some of the innovative and advanced L-CNG refuelling stations placed through the Atlantic and Mediterranean Road Core Network Corridors of Portugal and Spain. This will ensure the use of these supply points and, hence, secure the collection and analysis of meaningful operational data for the L-CNG refuelling operators to feed into the ECO-GATE study. Moreover, the trial operation and monitoring of the advanced & conventional natural gas vehicles has been recently launched. Transport companies will test and monitor the LNG heavy duty vehicles to analyse technology performance, vehicle emissions and fuel economy over several routes, involving mainly the road core network corridor. The data will be used to compare these parameters against other engine-fuel technologies over small, medium and large distance. 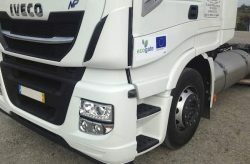 The ECO-GATE project is a European Union-funded project (EUR 10 million – USD 11.2 million), aimed at boosting sustainable transport through the use of traditional and renewable natural gas across Europe. The European consortium, led by Nedgia, will build 21 gas refuelling stations in roads in Spain, France, Germany and Portugal.